For a complete listing or to find a slaughterhouse near where you live, see the listing of provincially inspected slaughterhouses in Ontario here and the federal database here. Click here, for a map of every slaughterhouse in Ontario. Quality Meat Packers Ltd.is a privately-held company founded in 1931 by Nathan Schwartz and now run by third generation David Schwartz (president of the “fresh meats” division of QMP). QMP is southwest of King and Bathurst in Toronto’s downtown core, located on 2 Tecumseth St. (2 Tecumseth Street (416) 703-7675; the area in which the pigs are unloaded with paddles and electric prods is at 677 Wellington Street West – a couple of blocks away. Its headquarters are in Brampton (145 East Drive, Brampton, ON L6T 1B9 (905) 790-3737) where there’s a plant that makes “sausages” and other prepared “meats”. The Toronto slaughterhouse has the capacity to kill up to 6,000 pigs each day (Source: John Steele, “Meat packers in Toronto reject bosses’ ‘final offer,’ continue strike,” The Militant, Vol. 68, No. 44, Nov., 30, 2004). QMP has about 600 employees and sales in the range of $275 million/year at its two plants (according to Food in Canada article dated May 1999). Its key executives, according to Factiva, are Frank Schwartz, David Schwartz (president), Sheldon Garfinkle (Finance Vice President), Don Collis (General Manager). On any given hour on Lakeshore Drive, one can see several transport trucks crammed with pigs heading towards the Tecumseth slaughterhouse via Strachan Avenue and Wellington Street West. These tractor-trailers add to the heavy traffic. A number of accidents have occurred on the highway leaving dead and injured pigs, and sometimes dozens of pigs freely roaming the highways for a few hours. 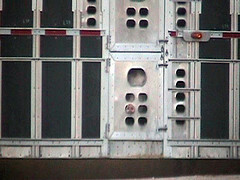 On October 4 2010, a tractor-trailer from Woodstock carrying 241 pigs was overturned on a ramp from southbound Highway 427 to the eastbound Gardiner just before 4:30 a.m. Eighty-one pigs died, while many pigs got loose and were free for a short while, before they were corralled and sent to their bitter end at the QMP slaughterhouse. The Toronto Star reports that police charged “a 26-year-old truck driver from Norwich… with careless driving.” Click here for photos and video. On rare, special occasions, animal rescuers are able to rescue one or more of the escaped pigs, as was the case for Wilbur in another transport-trailer accident. Twyla writes, “On a cold, wet winter night in Manitoba a transport trailer carrying pigs crashed, spilling several pigs onto a busy highway. Some were hit by oncoming cars and later shot by police officers. Wilbur was whisked away from the scene.” Watch Wilbur’s story on YouTube. This video, less than a minute long, shows the kinds of abuses that sometimes occur once a transport truck docks at a slaughterhouse and drivers forcibly unload the terrified pigs (in this case the driver used a rattle paddle to hit the pigs). The video, by Twyla Francois (Canadians for the Ethical Treatment of Food Animals), was taken at a slaughterhouse in Neepawa, Manitoba. The Quality Meat Packers slaughterhouse uses carbon dioxide (C02) to stun the pigs, where the pigs are put in a gondola, sort of like a ferris wheel, and are lowered into the gas to be stunned. There are no reports/eyewitness accounts from this particular slaughterhouse of the effect on the farm animals as they reluctantly enter the C02 gas enclosure. [However, Twyla Francois has observed the effect of CO2 at a slaughterhouse in Europe. See her report here. At a pig slaughterhouse in Europe that uses CO2, she says that “The pigs stretched their necks and attempted to break out of the reinforced steel elevator car to get at the oxygen that was above them. They screamed for a full 18 seconds.” She has taken photos of the pigs after the pigs emerged from the gas chamber]. At the QMS plant, when the pigs come out of the gondola, they are stunned. They are then shackled by a back leg and bled out. The United Food and Commercial Workers union represents slaughterhouse workers at Quality Meat Packers and addresses working conditions and worker rights. There needs to be a JUST TRANSITION strategy for workers to move from employment in animal exploitation industries to ethical, environmentally sound, and healthy alternatives which focus on vegan, organic, and local food production. There is an excellent film called American Dream, which deals with the relationship between the exploitation of workers and the abuse of animals by large corporations which emphasize profit above all else. Virgil Butler lecture (1 hour on vimeo): “Inside Tyson’s Hell: Why I Got Out of the Chicken Slaughtering Business” Virgil Butler worked at a chicken slaughterhouse and blew the whistle on the treatment of animals and workers after he showed his wife where he worked and felt embarrassed about his job for the first time; Laura had earlier volunteered at an animals shelter and Virgil says had “a natural desire to act when she sees something wrong.” Compassion over killing talks with Virgil Butler in In Memorial of Virgil Butler. See also PETA’s article on Virgil. Growing Activism: Labor/Community Strategy Centre focuses on social justice organizing, but mentions approaches and philosophy that apply to all injustice. 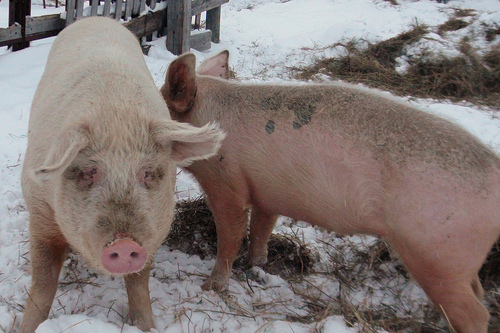 Among the largest pig slaughterhouses in Ontario are Quality Meat Packers and Fearman’s Pork. Both these facilities use carbon dioxide gas chambers to “stun” the pigs before they are hung upside down on one leg and bled with “hollow knives” and sent to the scalding tank to remove their hair. Though the pigs are supposed to be unconscious at the bleeding and scalding tank steps, this is not always the case! 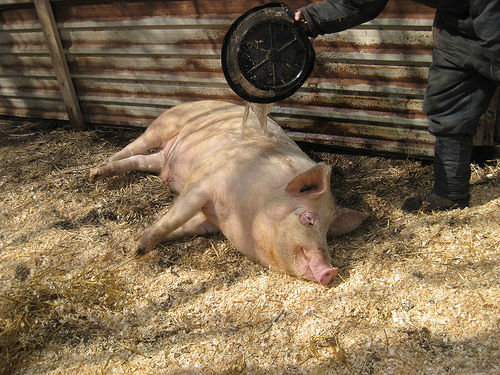 Once the pigs start blinking around 1.5 minutes after being stunned they are fully conscious, thus some of them may be going through this horrific process fully conscious. In its report called “Toxic Toronto,” Now Magazine (April 20-12, 2006) listed Quality Meat Packers as a major polluter of chemical pollutants into our air, land and water each year. According to the National Pollutant Release Inventory, QMP released 2.1 tons of ammonia into the air in 2009 and 0.6 tons of particulate matter (<= 10 Microns) and significant amounts historically as well. The health effects of absorption of fine particulates include bacterial infections and respiratory symptoms, aggravated asthma and cancer, with risks highest for the elderly and children. Global warming has been called humankind’s “greatest challenge” and the world’s most grave environmental threat. Many conscientious people are trying to help reduce global warming by driving more fuel-efficient cars and using energy-saving light bulbs. Although this helps, science shows that going vegan is one of the most effective ways to fight global warming. For further information, see our Protect the Environment web-page. Key issues to date are smell and noise pollution and concerns about animal welfare and protection, especially during the transport and unloading of pigs at 677 Wellington St. W.
For further information, see our Community Issues web-page. 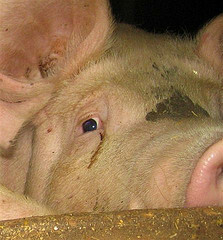 At Quality Meat Packers, 7,000 pigs are killed each day; 35,000 pigs per week. Fearman’s Pork Inc.(formerly Maple Leafs Pork) is the largest pork-processing facility in Ontario, slaughtering upwards of 45,000 every week and primarily servicing Toronto and the Eastern United States.